Aldehydes and ketones can be converted into alkynes with one carbon homologation using the α-diazophosphonate compound called the Gilbert reagent. When Y=H, the reaction needs a strong base such as tBuOK to proceed and base sensitive reactants are inevitably incompatible. However, with the modified reagent in which Y=Ac, milder bases such as potassium carbonate can be used, so the substrate scope is wider (the Ohira-Bestmann modification). 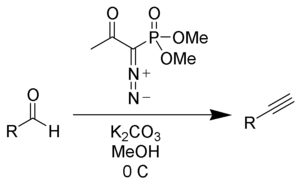 Deprotonation of the Seyferth–Gilbert reagent A gives an anion B, which reacts with the ketone to form the oxaphosphetane D. Elimination of dimethylphosphate E gives the vinyldiazo-intermediate Fa and Fb. 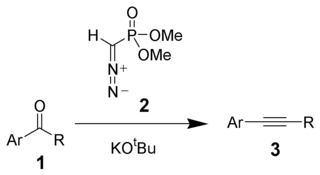 The generation of nitrogen gas gives a vinyl carbene G, which via a 1,2-migration forms the desired alkyne H.
Dimethyl (diazomethyl)phosphonate can be generated in situ from dimethyl-1-diazo-2-oxopropylphosphonate (also called the Ohira-Bestmann reagent) by reaction with methanol and potassium carbonate. Reaction of Bestmann’s reagent with aldehydes gives terminal alkynes often in very high yield. The use of the milder potassium carbonate makes this procedure much more compatible with a wide variety of functional groups. Recently a safer and more scalable approach has been developed for the synthesis of alkynes from aldehydes. This protocol takes advantage of a stable sulfonyl azide, rather than tosyl azide, for the in situ generation of the Ohira−Bestmann reagent. Another modification for less reactive aldehydes is made by replacement of potassium carbonate with caesium carbonate in MeOH and results in a drastic yield increase. Lithiated TMS diazomethane also works for the same transformation. Shown below is an example where it is used in the synthesis of (+)-Ambruticin. An example in the context of bryostatin synthesis. D. Seyferth, R. S. Marmor and P. Hilbert (1971). “Reactions of dimethylphosphono-substituted diazoalkanes. (MeO)2P(O)CR transfer to olefins and 1,3-dipolar additions of (MeO)2P(O)C(N2)R”. J. Org. Chem. 36 (10): 1379–1386. doi:10.1021/jo00809a014. J. C. Gilbert and U. Weerasooriya (1982). “Diazoethenes: their attempted synthesis from aldehydes and aromatic ketones by way of the Horner-Emmons modification of the Wittig reaction. A facile synthesis of alkynes”. J. Org. Chem. 47 (10): 1837–1845.doi:10.1021/jo00349a007. D. G. Brown, E. J. Velthuisen, J. R. Commerford, R. G. Brisbois and T. H. Hoye (1996). 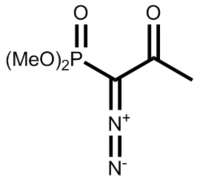 “A Convenient Synthesis of Dimethyl (Diazomethyl)phosphonate (Seyferth/Gilbert Reagent)”. J. Org. Chem. 61 (7): 2540–2541. doi:10.1021/jo951944n. S. Müller, B. Liepold, G. Roth and H. J. Bestmann* (1996). “An Improved One-potProcedure for the Synthesis of Alkynes from Aldehydes”. Synlett 1996 (06): 521–522.doi:10.1055/s-1996-5474. 5 G. Roth, B. Liepold, S. Müller and H. J. Bestmann (2004). “Further Improvements of the Synthesis of Alkynes from Aldehydes”. Synthesis 2004 (1): 59–62. doi:10.1055/s-2003-44346. 7 Lidija Bondarenko, Ina Dix, Heino Hinrichs, Henning Hopf* (2004). “Cyclophanes. Part LII:1 Ethynyl[2.2]paracyclophanes – New Building Blocks for Molecular Scaffolding”.Synthesis 2004 (16): 2751–2759. doi:10.1055/s-2004-834872. ・Ohira, S. Synth. Commun. 1989, 19, 561. ・Callant, P.; D’haenens, L.; Vandewalle, M. Synth. Commun. 1984, 14, 155.